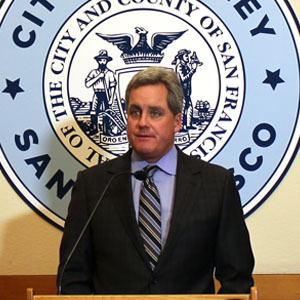 SAN FRANCISCO (Nov. 20, 2018) — City Attorney Dennis Herrera announced today that he had reached a settlement with the owners of a house in Bernal Heights that was the scene of a wild shootout while in use as an illegal hotel. The owners, Erik M. Rogers and his wife, Anshu Singh, had unlawfully converted the single-family home into a two-unit building and then illegally rented it out for more than a year through online short-term rental sites Airbnb and HomeAway/VRBO. As part of the settlement, the owners will pay $185,000 in civil penalties and be prohibited from any short-term rentals on the property for five years. The $185,000 figure effectively requires the couple to forfeit the $160,000 in ill-gotten gains they reaped from the unlawful rentals plus pay an additional $25,000 penalty. The money will be used to cover investigative costs and fund future enforcement. The settlement also requires the owners to bring the building into compliance with City planning and building codes within 180 days and abide by a strict injunction prohibiting similar unlawful behavior for the next 10 years. Herrera sued in May 2018 after a City Attorney’s Office investigation found that between July 2016 and October 2017, the owners had unlawfully rented out 212 Banks St. as a short-term rental for at least 487 nights, charging nightly rates sometimes topping $700, while they lived in Bali, Indonesia. Herrera filed the lawsuit May 10, 2018 in San Francisco Superior Court against owners Rogers and Singh. According to the civil complaint, the couple violated state and local laws by renting out the property for tourist rentals, including engaging in unlawful business practices, creating a public nuisance and violating San Francisco’s short-term rental law. The couple also violated a host of building and planning codes by illegally converting the house from residential use to tourist use and chopping it into two units without permits, according to the lawsuit. The couple used Airbnb and HomeAway/VRBO to rent the property for unlawful tourists stays from at least July 2016 through the end of October 2017. Roger and Singh maintained separate listings for the upstairs lawful dwelling unit and the main-floor illegal in-law unit, and would rent either or both units to tourists. Because the defendants are often in Bali, they hired and used other people to manage their unlawful rentals. The Office of Short-Term Rentals denied Rogers’s application the next month after determining the property was not his primary residence, that he had failed to submit the required business registration certificate and that the property contained an illegal kitchen and dwelling room. Undeterred, Rogers and Singh continued to rent the property to tourists in violation of the law for at least 11 more months.